The Canadian Survey on Disability collects information about adults whose everyday activities are limited due to a condition or health-related problem. The data will be used to plan and evaluate services, programs and policies. The survey is sponsored by Employment and Social Development Canada. Your contribution could benefit Canadians with activity limitations to help ensure their full participation in society. Your information may also be used by Statistics Canada for other statistical and research purposes. Your answers are collected under the authority of the Statistics Act and will be kept strictly confidential. In order to reduce the number of questions, Statistics Canada plans to combine income tax records and information collected during the 2016 Census to the information you provide in the questionnaire. We may also add information from other surveys or administrative data sources. Who will use this information? Why is the Canadian Survey on Disability important? Why should I respond to this survey? How many people will be contacted to participate in the survey? How was I chosen for this survey? How did you get my name and phone number? When will the results of this survey be available? Where can I find more information about the Canadian Survey on Disability? 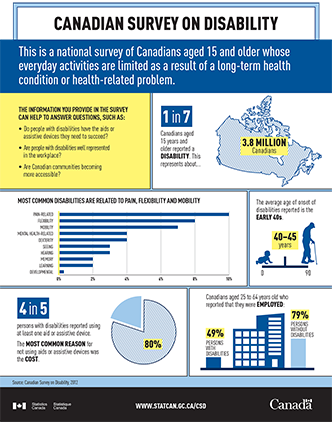 The Canadian Survey on Disability gathers information about Canadians whose daily activities are limited because of a condition or health-related problem. The survey will collect information on the type and severity of disability, the use of aids and assistive devices, medication use, and information on educational and labour force experiences. Information collected from Canadian Survey on Disability serves as a benchmark for many employers on whether they are meeting Employment Equity targets for designated groups including persons with disabilities. It is also used by various levels of government to evaluate and develop policies and programs designed for people with disabilities throughout Canada. In Ontario, the Canadian Survey on Disability serves as the standard for the Accessibility for Ontarians with Disabilities Act, whose ultimate goal is to make Ontario fully accessible by 2025. Internationally, data on disabilities are used to fulfill various commitments, including the United Nations Convention on the Rights of Persons with Disabilities. By participating in the survey, you can ensure that the results provide a complete and accurate picture of the issues affecting Canadians who, because of health-related condition, have difficulty carrying out their daily activities. This information will be used to plan and evaluate services, programs and policies for people with disabilities to enable their full participation in society. Approximately 55,000 persons from across Canada. Either you or someone from your household completed the 2016 Census for Statistics Canada. Your name was randomly chosen from a list of all individuals across Canada who reported having difficulty sometimes, often, or always to at least one of the Activities of Daily Living questions. Results of the survey will be available in the winter of 2018/19. For more information about the survey, please call the National Contact Center at 1-800-263-1136 or text telephone for those with hearing loss (TTY) at 1-866-753-7083.